Located in Richmond, Evolutio is a world class supplier of fine Physiotherapy, Remedial Massage and Elite Rehab. Back when your grandpa was a spring chicken, seeing someone for your back consisted of taking the trek to see the local doc who had an over-sized needle and a worn out bottle of scotch. The Evolutio team are basically that old doc with a new twist. Specialists in their areas of Physiotherapy and Massage, especially with athletes involved in sport, endurance events or the gym. If you need to see someone for an injury, whether it's from too much Scandinavian handball, deadlifting 150kgs, playing elite totem tennis, or running away from your mother in law. We're the team to see for great sports physio treatment here in Melbourne. A unique team and business, deserves a special space. 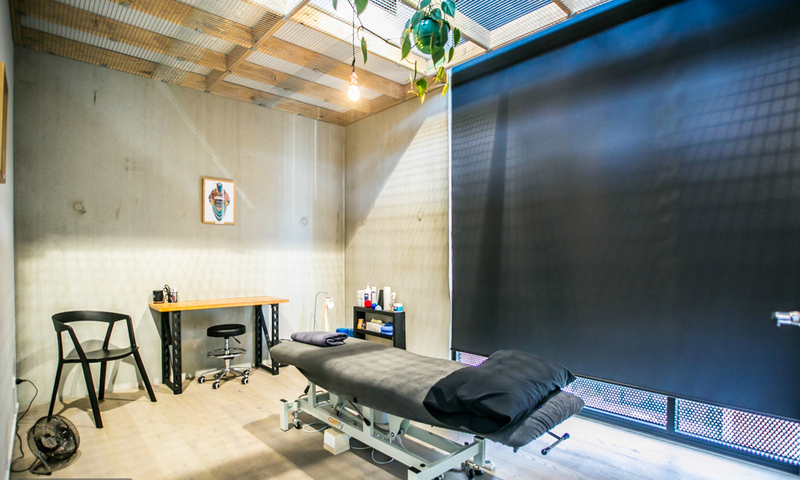 Here at Evolutio, we may provide the best Sports Physio in Richmond, Melbourne, but our space backs up that we are working hard to re define the stigma behind medical clinics. Our waiting room consists of hot desk workstations for you whilst you wait for your appointment, in addition, you're welcome to have a coffee, tea, beer or wine prior to or after your appointment and have a chat with us. Our treatment rooms are all individually designed. Our basement gym is available for you to use prior to, or following your session with us. Just don't do anything crazy. We can't fix broken bones with spells like they do in those Potter films.